Lewis Foreman in his booklet essay guides the listener through the lives of Potter and Sterndale Bennett - as with Vaughan Williams please resist the temptation to hyphenate! The 1867 Symphony sounds rather like Schubert with infusions of Weber. It shivers and bristles with lovely effects including superb antiphonal dialogue from first and second violins split by Bostock right and left - Boult and Handley-style. There is some exciting writing for the horns which looks forward well into the new century to Stanford's Second Piano Concerto. In the two outer movements it is also possible to discern the rather tense and eager romanticism of Parry's neglected First Symphony. In its first movement it has the harried overcast angst of Schubert's Unfinished Symphony. The following Minuetto is relaxed apart from some not very stern admonitions from the brass. The third movement has a Dvoř�kian pastoral lilt which continues with pattering delight into the Mendelssohn-style Intermezzo. Sturm und Drang shakes the rafters of the Rondo finale which again displays Mendelssohnian traits alongside great draughts of 'the grand manner' from Schubert 9. Indeed the Great C major is bound to be in your mind as you hear the closing pages. Sterndale Bennett is reasonably well known to enthusiasts who may have some of the previous recordings on Lyrita or Hyperion. Potter is an unknown quantity except to those in the UK who heard the BBC broadcasts of 1995. That mini-series featured four of the Potter symphonies in which the Ulster Orchestra were variously conducted by Jerzy Maksymiuk, John Carewe and John Lubbock..
Potter is not afraid, in this 1826 symphony, to embrace Beethovenian conflict. However he quickly contrasts it with an almost Bellinian bel canto at 3.50 (tr. 6) which he then toys with fugally before yet more emotional abrasion is let loose. The andantino grazioso may well remind us of late Haydn or the first two Beethoven symphonies. It ends with hunting horn evocations. The finale with its rusticity and playfulness looks to the example of Beethoven's Pastoral but with an element of the operatic Wolf Glen. 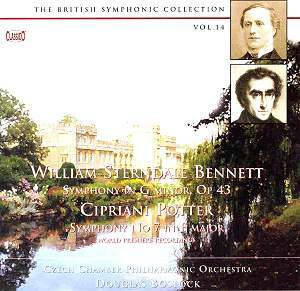 Both of these nineteenth century British symphonies are performed with élan and doughty style. Where ClassicO have lead the way it would not surprise me if CPO were to follow. This is a typically well documented CD and we are indebted to ClassicO for drawing the curtains back to let in the light on these two symphonies. While the most immediately pleasing of the two is certainly the Sterndale Bennett it is fascinating to hear the Potter. I hope that there will be more from both composers' symphonic output. Cipriani Potter isn't altogether an unknown quantity, though you have to go back a little. Symphonies 8 and 10 were recorded in 1989 by the Milton Keynes Chamber Orchestra/Hilary Davan Wetton. Released on Unicorn-Kanchana DKP(CD)9091. Admittedly unavailable for ages.